Fix My Back Pain System Review – Find Your Relief! Fix My Back Pain System Review! If you suffer from any kind of back pain than you need to check this out! I am going to let you in on a program one of my former therapist turned me on to. It’s called the Fix My back Pain System. In many cases the pain we feel in our bodies is caused by muscle imbalance. This is even more relevant for people that may have had an injury, or have over trained, as the supporting muscles may have been weakened. Every joint, as well as our spine, is connected to different muscles. Some of these muscles are pulling in an opposite direction of each other. If one muscle group is stronger than the other, that joint or the spine then gets pulled out of it’s optimum shape. We feel this as pain and discomfort. If you are suffering from pain and discomfort in your lower back then I suggest you read this full review of the Fix My Back Pain system. What Is The Fix My Back Pain Program? The Fix My back Pain program is an all natural approach to relieving or eliminating your back pain. It focuses on muscle imbalances and how they can affect your your lower lumbar area, as well as your daily life. This program will teach you Ricks approach to back pain and how you can fix the muscle imbalances. All from the comfort of your home or gym. The Fix My Back Pain Program uses the BR3 method to reshape your aching back and get you back in the action. 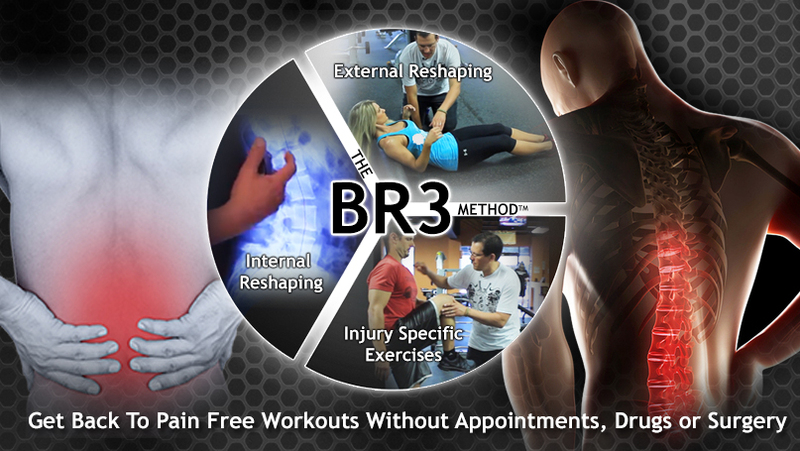 BR3-Method is short for “Back Reshaping 3-Part Method”, (more on this in a moment). The Fix My Back Pain was created by injury specialist and exercise physiologist and Kinesiologist Rick Kaselj MS., along with Mike Westerdal, power lifter & Best Selling Fitness Author. Rick has over 16-years of hands on experience, and a Master’s Degree in Exercise Science. The Back Reshaping 3-Part Method! The “Traditional Back Pain Model” involves endless cycles of appointments, investigations, stretching and strengthening. Rick had helped hundreds of his clients go through this old school method. Rick knew that he needed to find a new approach that would break the traditional back pain model. This is when he set out to find the missing pieces, and to create a system that worked. This led to the creation of the BR3 Method which is based on one key philosophy. Reshaping your lower back from a painful lower back to a pain-free lumbar spine. The best part is you can do this yourself, and in the comfort of your own home. Let’s take a minute a look at the three parts that make up the BR3 system. The first stage in the process involves using internal reshaping. This is a simple process in which you will create a environment in your lower back so that you have a pain free lumbar region. The second part of the BR3 method is reshaping your back from the outside. Now you will start doing things that will continue the reshaping of the lower back. With the focus being on what you can do to reshape it from the outside to attain a pain free lumbar region. Now that you have begun to reshape your back from the inside out, the next step is to focus on injury specific exercises. Most therapists do all the same exercises no mater what the back injury is but this is not right. In this system about 60% of the exercises are the same for all back injuries. However, the other 40% are more injury specific and this is very important to note. Here Is What You Get With The Fix My Back Pain Program! Rick will teach you everything you need to know in the Fix My Back Pain system. He will go through the 3-part program in full detail by using easy to follow videos and instructional guides. Allowing you to reshape your lower back to a pain free state. 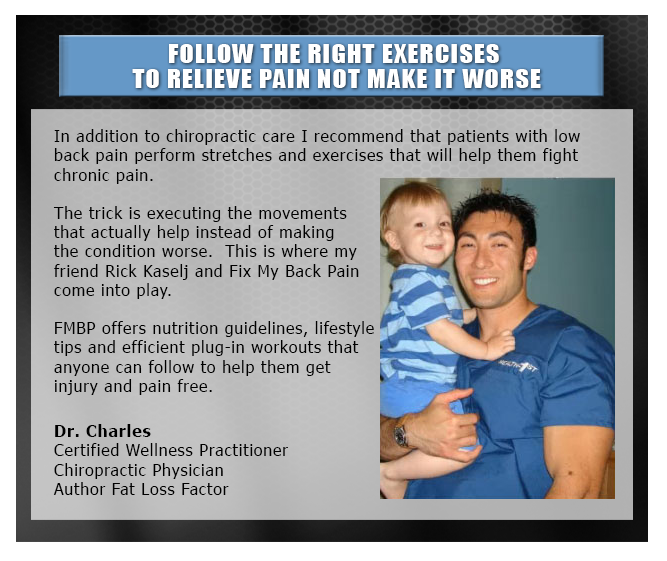 Along with a quick start video you will also receive three other components making up the Fix My Back Pain system. Let’s take a minute so I can show you what to expect with your purchase. This is the welcome and introduction tour of the Fix My Back Pain program. The video portion of this segment will help you determine “What Is Going On With Your Lower Back“. Rick will take you by the hand and walk you through your self-assessment. Rick will also have you preform a simple movement that he shows you. Based on how that movement feels to you, you will be able to access what injury you are suffering from. 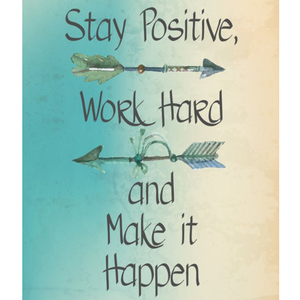 Here you will begin to take some simple steps towards creating a positive environment. You will be addressing the muscle imbalances and how you can correct them. Rick has five easy steps that he will have you follow in order to start the reshaping process. Allowing your lumbar spine to begin to reshape from a painful state to a pain free state. In this second component of the BR3 method you will focus on what you can do to reshaping your lower back from the outside. Here again there are five steps that you need to take to continue the process of reshaping your lumbar area. And the best part is it will only take a few minutes for you to implement. The final component of the course will focus on injury specific exercises. All back injuries fall into one of four categories: Herniation’s and Bulges, Sprains and Strains, Sciatica and All Others. Once you figure out which category your back injury falls into you will decide the injury specific exercises that you should do. The Online DVDs will explain everything step-by-step for you to follow. This segment will help to save you time, money, heartache. In addition to that it will also save your health when you no longer look to medication and surgery as the only alternative. 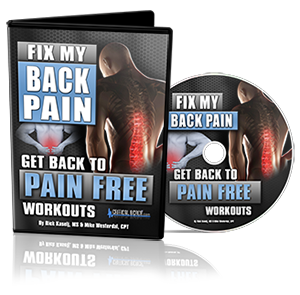 Fix My Back Pain Pro’s & Con’s! Like everything else in life there are the good things and the bad things. So lets take a minute and go through them. You do not need and special medications or drugs, it is all natural. There are no painful and expensive injections or surgeries needed. No need to spend time or money on therapy that may or may not help. You can do everything in the comfort of your home or gym. No need to go anywhere. In most cases this is a long term solution to your back pain. You can use these techniques for the rest of your life. It costs less than $20 to get started! What more can I say about that? The Fix My Back Pain program is backed by a 60 Money Back Guarantee. It works like a charm! The tactics you learn here are guaranteed to help you find relief from back pain. Now for the downsides of this program. It is not available in stores. That is okay because I will show you where you can get it. The program is only available in PDF and online DVD’s. The good thing is you can print or copy anything you need. You do have to commit some time each day. It is only about 35 minutes. However to achieve true success it will take some effort on your part. So as you can see there are a few drawbacks. However I think the overall outcome far out weighs a few con’s. Fix My Back Pain FREE Bonus Items! There are 4 Free bonuses that are included with you purchase as well. Your Video Guide to Pain Free Dead lifting and Barbell Dead lift Dominated. You’ll be shown how to perfect your form in an easy to understand step- by-step manner. The 48-Hour Back Pain Rescue Guide. Rick Kaselj has used this program many times with his clients to overcome a back pain flare up in 48 to 72 hours. The No Back Strain Workout. This is a 30-day routine you can follow that eliminates all compression, flexion and extension of the back. Earn 3 CECs/CEUs. If you are a health and fitness professional. You can earn 3 continuing education credits (CECs) & 3 continuing education units (CEUs) with Fix My Back Pain. Pretty nice bonus package wouldn’t you say? Now you know everything that is included with the Fix My Back Pain training course. Check out this short video presented by the creators of Fix My Back pain and learn what Rick and others have to say about this program! So there are just a few more things I would like to touch on before you make your decision as to buy your copy of the program or not. As you can see there are a lot of items and information included with this program. However the most valuable thing you will receive is the relief from your daily back pain. You already know that this package cost just $19, in addition to coming with a 60 Day Money Back Guarantee. So there is really nothing for you to lose. If you can get even the smallest amount of relief from just one of Ricks recommended practices. Wouldn’t that alone be worth twenty bucks? But you are not going to get just that, you will get so much more out of this program. I recommend this program to anyone that is suffering from lower back pain. No matter how minor your injury may be, I know you can find the relief you are looking for right here! Look if you have a serious injury, I am not saying this is the fix. An injury is an injury. What I am saying is the tactics that Rick implies will bring your some relief. He will help you to reshape the spinal lumbar area and help to ease the pain and discomfort. Only you know if you can preform the exercises and stretches required to participate in this course. As with any form of training program you should consult your physician to ensure you are healthy enough to begin. Thanks for checking out this Fix My Back Pain system review. If you have any questions or comments please leave them in the comment area below. Or you can contact me by going here. And I will get back to you as soon as possible! Previous Post Previous post: Get Your Manifestation Meditation FREE Download Today! Next Post Next post: How To Fix My Back Pain – This Works For Me! Appreciate you sharing the Fix My Back Pain product. I just read your review and found it to be very informative. The BR3 method looks to be innovative and to be honest, very common sense. It’s amazing how deep into the endless circles people have to go to get some back pain relief – chiropractor, physical therapy, doctors, on and on. This looks like a great product and system that people with back pain can try on their own. And for $19 and a money back guarantee? What’s to lose?! My mom has had chronic back pain for the last 10 years, even to the point of having a nerve disruptor placed into her back. I’m going to suggest she check on Fix My Back Pain. I my self have an injury in my lower back, and I know all about the endless circle of doctors and therapists. Not to mention the cost of lt all. Talking with other people, this crazy circle usually leads to the recommendation of surgery. What I found in my own research is that not all of these surgeries are helpful, nor are they all necessary. I found the Fix My Back Pain Program by a recommendation from one of my former therapist. I was moving and she told me to check it, that she thought it might help. Now I still have my injury, and I still deal with back pain from time to time. However, after applying what I have learned from the Fix My Back Pain system, I have far less episodes and bouts with my back pain. It has helped me live what is basically a normal life, and I would be willing to bet it might just help your mom as well. I used to spend $20 a month on just ibuprofen, so to me this was a no brainier. Well Mat A, thanks for the comment, I hope your mom gives this a shot, the only thing she has to lose is discomfort and pain. Back pain is so awful! I love that this product focuses more on shaping and strengthening the back instead of just using medication to hide the issues. I have a friend that had so much back pain and used so many doctor prescribed pills that when he finally decided to do more of a physical therapy type thing he had to go to a rehab center just to help get him off of the drugs! There is so much we can do to care for ourselves at home if we only know how. You are so right, we can do way more for ourselves than most people know! It is easy to get off track though, with the mainstream media and all. It seems to me that many doctors are nothing more than prescription writers. I took the time to do my own research, and I avoided an unnecessary back surgery. I am not saying that someday I won’t need it, but it has been 10 years and all is well. That is due, in large part, to setting out to find a different approach than I was being told. Every since I got up and got active, my back problems have diminished greatly. You bring up another good point. Nicole there are thousands of people that end up in the dame situation as your friend. They get hooked on the pain pills, and it happens fast! Then they have to fight to get off of them. I have seen cases where the battle to break the addiction is far worse than any pain the injury may have caused. There are better ways to address injuries if one will just take the time to look, and apply themselves to the practices. The Fix My Back Pain program is one of those. You see the creator Rick is an injury specialist with more than 16 years working directly with those that have injuries and special needs. He learned early on that the traditional approach was not working. So he created the BR3 method. Reshape the inside, reshape the outside, and add strength and muscle with injury specific training. The Fix My Back Pain program is the exact approach Rick uses in real lifw, I know it has helped me, and I believe it can help others! Nicole, if you have anybody in your life that is suffering from a lower back injury, be sure to introduce them to the The Fix My Back Pain system! Hello Brendon. I have chronic back pain and I’m looking for relief. I’m tired of taking prescription medication for relief. Although it works, I don’t like the side effects. I just finished reading your Fix My Back Pain System Review. You’ve convinced me to go ahead and give it a try. For only $19, it’s worth a shot. I’ve tried all kinds of therapy and exercises but nothing seems to work. I hope this does the trick. I’d be forever grateful! I know you have a back problem, and I also know this program can help you out! Rick has put together an amazing approach to address back pain and injuries. He helps you rebuild and reshape your lumbar region from the inside out, building up your core strength. The Fix My Back Pain System program has worked out well for me, personally I could not be happier! For less than $20 you just can’t go wrong! I know for a fact that it is a better option that pain pills, at least in my opinion. Good luck my friend, please let me know how it works out for you. Thank you for your thourough review. I have had lower nack pain as a result of poor posture for years. I went to a chiropractor who was also a physical therapist who told me that no matter how many adjustments I got, it would never permanetly correct my posture. I will definitely look into ordering this course once I can come up with the money. Thanks for your great review! While I am not a medical professional, I do think the word “never” might be an extreme answer. I have met a handful of people that have been told never in some way. Yet they have gone on to achieve the results that they were seeking. To some level I think it comes down to the individual. That is not to say that there are not plenty of cases where an injury would cause permanent results. Baring the idea of injury, another prominent cause of poor posture and back pain and discomfort is muscle imbalance. This is a situation in which one muscle group is stronger than the opposing muscle group. This causes shifting and tilting within your joints and spin. There are a number of causes for these muscle imbalances. Things like bad posture habits, prolonged sitting, and in many cases over strengthening one muscle group and neglecting the other. The good news is that muscle imbalances can be fixed. It will take some effort on your part, and a proven training system, but it can be done. The Fix My Back Pain program is just that system. Rick Kaselj MS. has put together a training and strengthen program that tackles these imbalances from the inside out! Micheal, I can tell you that it has helped me. I have two injured discs in my lower back, and increasing my strength and eliminating the imbalances that I had have helped me a great deal. I still have the injury, however by regaining my core strength I have increased my mobility greatly. The Fix My Back Pain system has proven to be well worth the cost, which is far less than a single visit to a chiropractor or therapist. It has also done for me what a number of these other “specialist” could not! 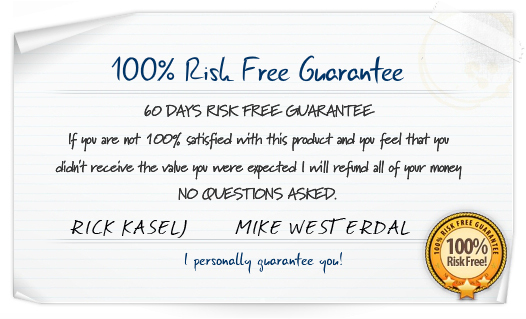 Micheal, there is a 60 Day Money Back Guarantee, so the only thing you really have to lose is the pain and discomfort. Keep me updated with your progress and good luck!